This Amistad Research Center reblog features poet John Langston Buckner (Apr. 8, 1836 Canada–Nov. 27, 1908 Topeka, Shawnee County, Kansas, USA; buried Mount Hope Cemetery (Plot: North Memorial V), Topeka, Shawnee, Kansas), son of Thomas Jefferson Buckner (Abt. 1810 Kentucky, USA–Abt. 1875 Junction Twp, Osage County, Kansas) & Elizabeth Kirk (July 15, 1815 Kentucky–Apr. 21, 1904; buried Dean Cemetery, Pomona, Franklin County, Kansas). See my own July 22, 2016 post here at The Mix That Makes Up Me, “born in slavery: thomas jefferson buckner,” for background on John Langston Buckner’s parents. First page of “Margaret Garner and Her Child” by John L. Buckner. April is National Poetry Month in the United States. This recognition of the poetic arts was inaugurated by the Academy of American Poets in 1996, and in celebration of all things poetry, as well as Amistad’s literary holdings, we will be posting multiple blog entries regarding our poetry-related holdings this month. 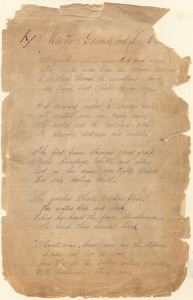 This entry was posted in Ancestry, Family HIstory, Genealogy and tagged BUCKNER, Poetry. Bookmark the permalink.